Crosswinds Toastmasters: Iowa Academic Decathlon Volunteering Opportunity! 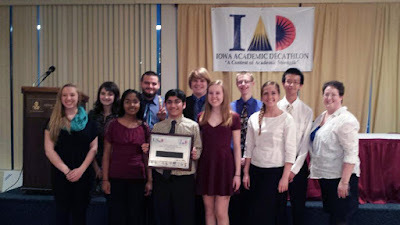 This year's Iowa Academic Decathlon state championship will be held at Iowa Central Community College in Fort Dodge, on Friday, March 2nd and Saturday, March 3rd. The competition is composed of 10 events, including a speech competition, which takes place on the evening of March 2. Event coordinator, Kim Olson, needs help lining up judges for this competition. Fort Dodge does not have a high school which currently competes in Academic Decathlon, which should help ensure neutrality from local judges. Toastmasters are being reached out to because we have more experience than most the judges have with listening to speeches, the more they will bring to giving the students a fair and critical hearing! This is a volunteer opportunity, which will run from around 4:00 until about 9:00 p.m. Judges will be given a brief orientation, during which an Academic Decathlon board member will explain the rubric used for evaluating speeches, and the general philosophy. A break, with dinner included, will be provided for every judge. separate rooms. Three judges in each room.